My Red Foxes sighted at the “Scale” Exhibit! 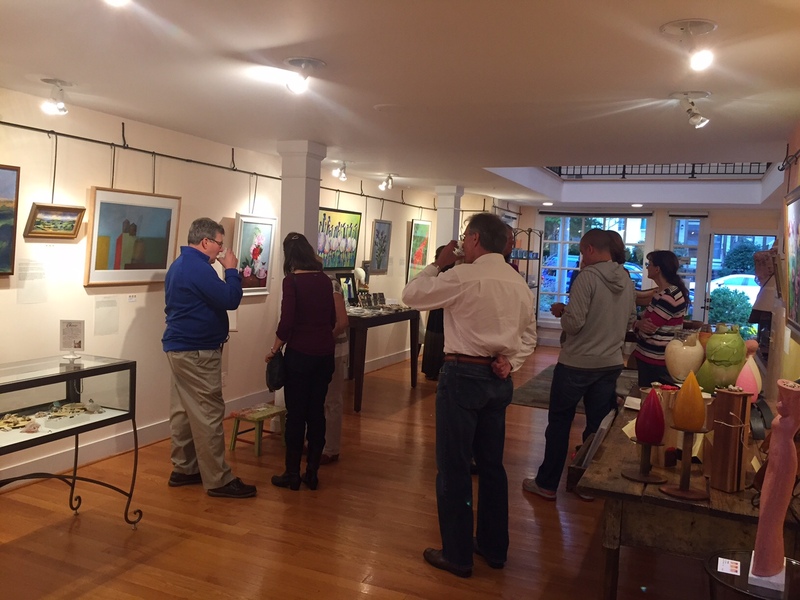 Entering juried exhibits is one of many ways I like to expose new audiences to my artwork! Entering a themed exhibit is uncommon for me so when Live an Artful Life Gallery of The Plains, VA put out the call for entries for their “Scale” exhibit, I was tickled to have pieces underway that met the criteria! Interpreting the same subject in two scales, one 18″ x 24″ and the other 8″ x 10″ was the theme! 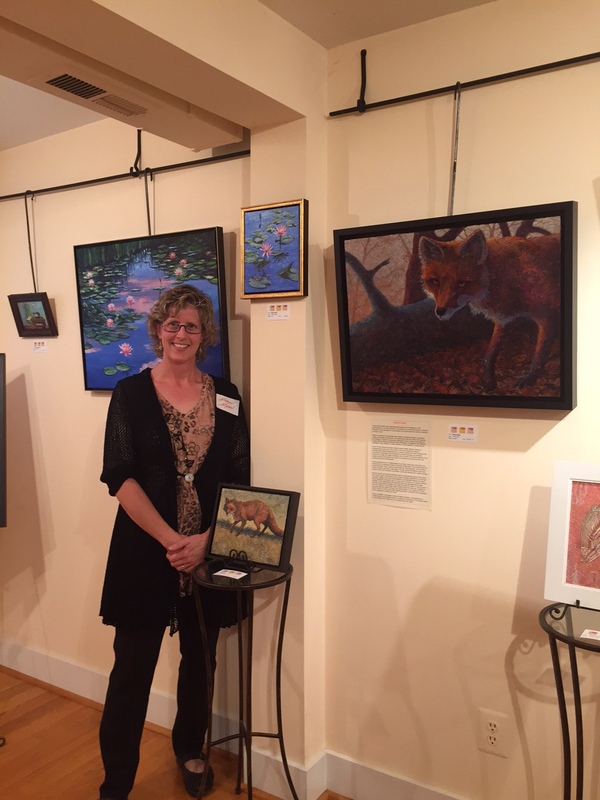 I was thrilled to have my two Acrylic Layer paintings I created of a red fox I had sited in my back yard accepted into the exhibit, along with the work of 10 other wonderful regional artists. 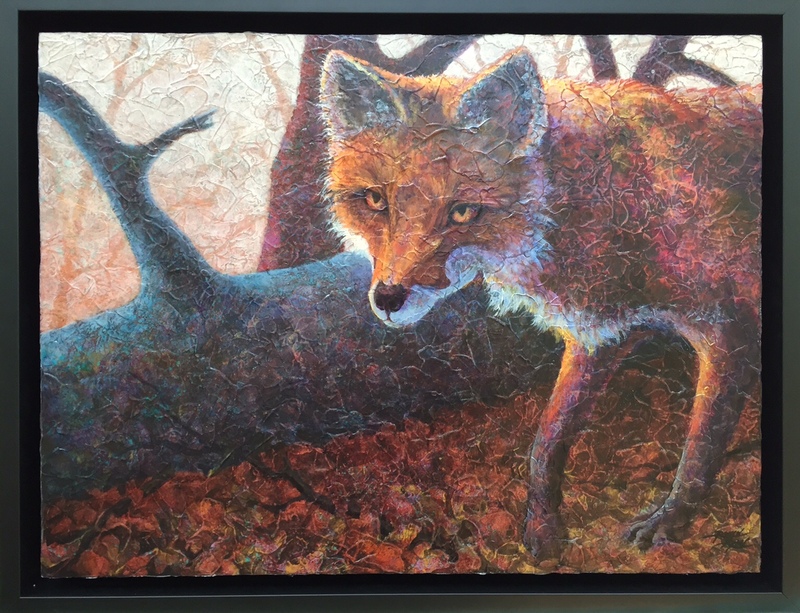 “Woods Walker” is 18″ x 24″ and zooms in on the fox walking “into the frame”. “Red Fox II” (I know, how original a name!!!) 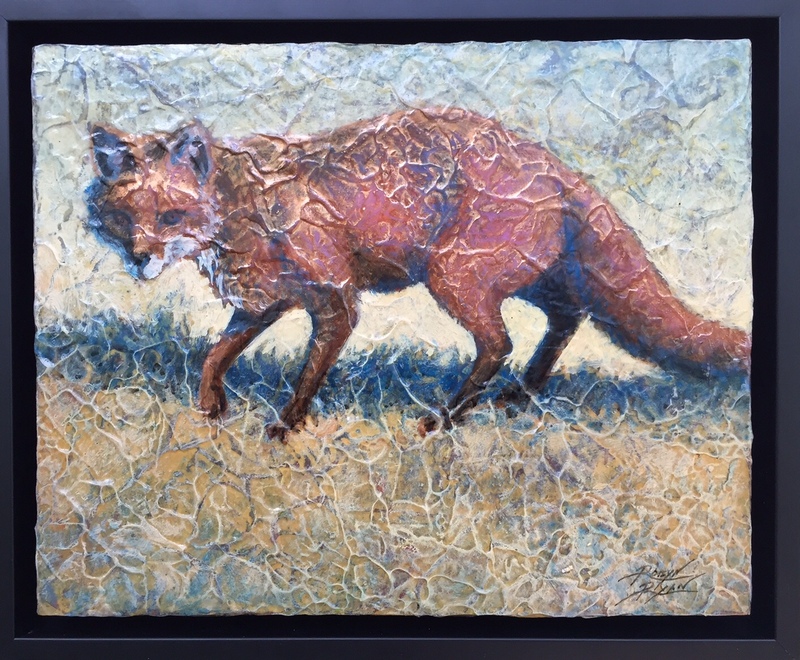 is 8″ x 10″ and depicts the same fox walking across a field. I had started “Woods Walker” with several other Acrylic Layer pieces I was preparing for my February 2015 “In Their Element” exhibit with photographer Darren Barnes, but did not complete it in time. I wrestled with how to resolve this one since I had set up such a compositional challenge for myself with the “cropped” fox in a field of space… what to do?!?! The fun part of the story is that I used the in process painting as a model for a collage piece where I broke up the background… Well, of course! That is when I added the woods context to the background actually incorporating handpainted papers as a collage element to define the negative spaces between the trees! I love when one piece “speaks” into another like that! “Red Fox II” was started in studio and then completed as part of my demonstrations of my Acrylic Layers process during a workshop I was teaching. Amazing how differently the exact same source material can be interpreted, both compositionally and by scale.